Camping/accommodation: Indoor accommodation on the island seemed pretty expensive - it probably didn't help that we were there on a Saturday. As for camping .. I'd say you probably could camp on a beach if you ask the right people. It's not that big an Island, so I can imagine it would be hard to find a properly hidden away place. In Donegal many of the trails we were walking were part of the SlÃ­ Dhun na nGall. This titan trail includes three of the many islands drizzled along the coastline. The names of these three are Tory, Gola, and Arranmore. We were unsure of whether we should include the islands, we decided to make it our mission to visit at least one. While taking a day off between trails in Dungloe we realised that by walking up a 10km section of the SlÃ­ na Rosann we would end up at the small town of Burtonport, where the ferry for Arranmore Island departed. It was too simple not to do, so we went. The walk from Dungloe up to Burtonport goes along small backroads and some old railway line, and brings you right in through the working docks to the small port there. We saw a portacabin with a large blue sign shouting â€œFERRYâ€� stuck on the wall above it. Itâ€™s only after weâ€™ve bought our tickets and walk back outside that we see, on the other side of this particular slip is another portacabin, this time shouting FERRY on a bright red sign. We take no real heed and find a wall to sit at while we wait. Itâ€™s only as the ferries arrive that we start to smile. There is one blue boat, and one red boat. The crew of each wore jackets of their assigned colour. Otherwise it was all identical, and slightly hilarious watching these parallel worlds doing the same things without interacting at all. We wondered if, on days where one boat was short staffed, would a blue coat turn his jacket inside out and become a red coat? The ferry trip itself was really fun - it had been ages since either of us were on a boat, and the route over to Arranmore passed and twisted through hundreds of mini islands and outcroppings. We chugged past a fishing boat being swarmed with sea gulls, their cries deafening. The sun was streaming down, and the biting wind chilled my nose and ears until they were ringing with frosty pain. And then weâ€™re docking at the other side, the boat beaching itself like a small whale on the slip, the sounds of scratching metal on rock and the clang of a lowered ramp announcing our arrival to the island. We wander into the village and walk up to a small cross roads in search of the info board that we use as our starting point. It was a bit rickety and worn, but we found it and marked it as our start and finish. We set off clockwise around the island, stopping in a small pub for a coffee and crisps. Some match will be on later that day and the father and son behind the bar discuss where to have the projectors pointing, how to do the sound. Setting off again we make it a couple of kilometres before we see a sign for a cafÃ© and decide that the first coffees really hadnâ€™t done enough. We walk down towards the beach for a couple of kilometres, trying different lanes and paths. No cafe was found - by us or the other cars of tourists that drove up and down past us. Still feeling sleepy we notice the time and realise we should probably get a move on with the actual walking. The trail takes you on tarred road as it circles the island - itâ€™s actually the main ring road, if you can imagine a main road being single lane, unmarked and winding up and around the hills and bogs. The east side of the island is the inhabited side with lots of houses and sheds. As the trail brings you further around, you start to see the wilder and uninhabited interior and western side of the island. Itâ€™s beautiful there, the landscape is so erratic and unexpected. Trail wise, because the route is all along local lanes itâ€™s not so much a hike, but definitely a beautiful walk. It would probably be really fun to cycle too - those hills are crying out for something with wheels. There are amazing views of the coastline and the sea at every bend, and we spend plenty of time gazing down at the crashing waves. There are even some benches along the way! 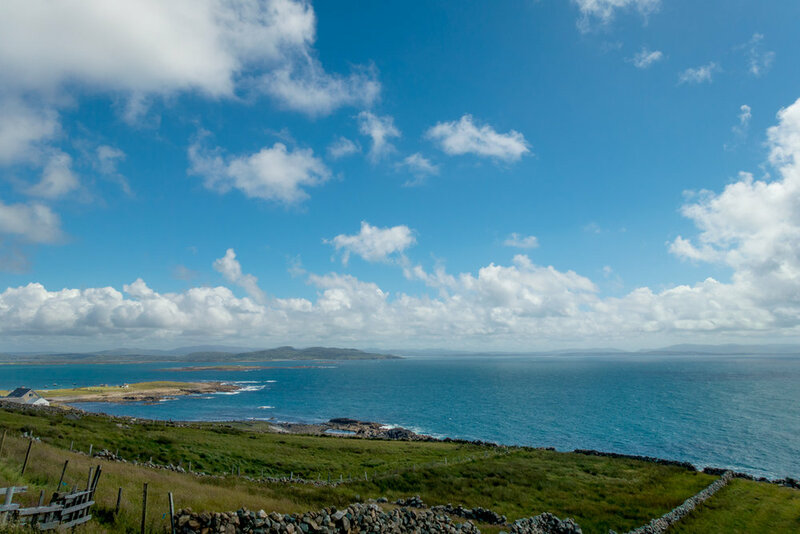 Coming back across the north side of the island you get to look back towards the main land of Donegal and see the seven sisters - the mountain range that includes Earagail, Donegalâ€™s highest peak. Coming back towards the east side again we start to be engulfed by bungalows once more, but there presence is deceiving. It might sound a bit crazy, but it really looked like for every lived in house there was at least one standing empty and derelict beside it. From far off it looked like a large bustling village, only walking through it really showed how empty the place was. There is a spur walk to the Lighthouse that sits up at on the north-east corner. We didnâ€™t have enough time to go that far if we wanted to make it back for the last ferry. This trail is probably perfect for a family outing - the ferry is fun but short and the roads are fine for buggies and kids that like to run around. While waiting the final few minutes for our ferry back to Burtonport we munch on some hotdogs - I say some as we went back and get seconds. Hotdogs are such a strange food: thereâ€™s nothing about them that should be appealing, all over processed starch and grease, but theyâ€™re so delicious. On the ferry ride back we notice the seats at the front of the boat, huddle against the wind and watch the sun shining on the sea. Iâ€™m pretty tired by the time we get back on land again but Carl really wants to walk back to Dungloe. Itâ€™s not like this is an official trail where I have to walk, but weâ€™ve both walked everything that the other person has walked so far, and that makes me stubborn not to thumb for a lift. I grudgingly walk back with him, not really happy with any option. Itâ€™s interesting what becomes important to you when youâ€™re on the road trying to do something. I think every distance hiker has their rituals or stipulations. When we were walking in Spain we didnâ€™t take any motorised transport (expect for one ferry) from Bedart in France (the town where the airport was), until we made it to Finisterre, the end of the world. This time, so far, I think weâ€™ve both walked exactly the same route around the country, and even on small day outings that arenâ€™t really related, I feel the same pull. One of my favourite things on this trail were the old weathered wooden signs for the Siuloid Arann Mhoir (Arramore Way). Each was worn and faded in its own uniquely beautiful way, with Elvis deeply embossed, sometime painted yellow. They merged with the landscape so perfectly. Further details can be found on the Irish Trails website. You can subscribe to get our blog straight to your inbox! Thank you to the wonderful support of our Patrons who make all of this possible.